It’s a love-filled November as StarStudio releases its pre-holiday issue with engaged couple Heart Evangelista and Sen. Francis ‘Chiz’ Escudero. The couple sat down with the magazine for an interview to talk about their love story and highly-anticipated February 2015 wedding in Balesin. Heart and Sen. Chiz also share with StarStudio exclusive details about their upcoming wedding, including the design inspiration for Heart’s gown, who will be catering the wedding, their cake, flowers and music, the reception they are planning in Manila for more of their family and friends, as well as showbiz and political colleagues, and their thoughts on walking down the aisle. 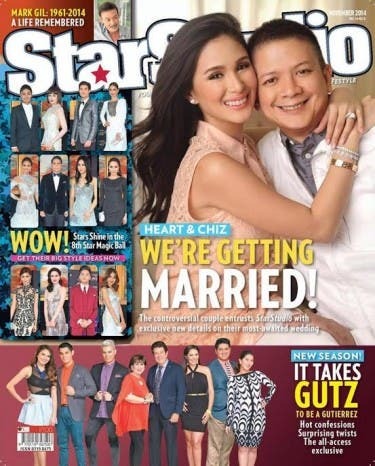 This issue also contains back-to-back features on two recent showbiz debutantes: Jane Oineza and Ella Cruz, a last look at the memorable red carpet looks from the 8th Star Magic Ball, as well as other meaty stories that will set the tone for a happy, love-filled and unforgettable holiday season. i admire how heart and chiz manage their relationship. matured people must follow the dictates of their heart and mind for as long as you dont step on others toes. mabuhay kayo heart and chiz . am expecting a smart and beautiful kids just like you and heart. Congratulations and best wishes!!!!! for marian and dingdong Congratulations too. dont allow your fans to fed you wrong info to the point of making you appear spc. marian that you are insecure with heart. if heart has everything i also believe you have everything too.. kya make peace n kyong dalawa pra good carma kayo s new life n you are about to enter to. On sale na siya guys, hindi mabenta copies nung mag. Grab one now at kawawa naman si Heart iyong kina Marian hirap na ako maghanap sold out na why o why? On sale na siya guys, hindi mabenta copies nung mag. Grab one now at kawawa naman si Heart iyong kina Marian hirap na ako maghanap sold out na kainis! beautifl bride to be! all the best Heart and Chiz!! Kadiri! Kakasuka!heart evangelista mukhang pera.